Computed Tomography (CT or CAT scan) is a painless radiology exam that uses a combination of computer and special x-ray equipment. It creates detailed images or scans of bones, organs, blood vessels, and soft tissues. CT scan is primarily used for examining internal injuries or abnormalities. The scan creates more detailed images than a regular x-ray. It is a fast, painless, non-invasive, and accurate procedure. Abdominal CT scan will be recommended by your doctor to assess injuries, tumors, infections, abdominal pain, or intra-abdominal bleeding. A CT scan of the abdomen is also helpful in evaluating the treatment of abdominal tumors. This procedure also guides your doctor in biopsies. Pelvis CT scan will be recommended by your doctor to diagnose problems related to the bladder, liver, uterus, bowels, and prostate. 1 Why is an abdominal or a pelvis CT scan performed? 2 Is there radiation involved? 3 How do I prepare? Why is an abdominal or a pelvis CT scan performed? Yes. Similar to an x-ray, CT scan is an imaging test that uses a small amount of radiation to show images of organs, tissues, and bones of the body. Once the procedure is completed, you will receive your results within three to five business days in your LabFinder portal. Precautions: If you are pregnant or think you are, please inform your doctor. Your doctor will discuss other medical options with you. Wearables: Wear comfortable, loose-fitting clothes. Avoid wearing jewelry as it may interfere with the scan. Contrast: Sometimes a CT scan is performed with a contrast agent. This agent is iodine-based. Therefore, if you are allergic to any kind of contrast agent, please inform your doctor or the radiologist. Eat or drink: If your doctor has suggested a CT scan without contrast, you can eat and drink normally. If your doctor has suggested a CT scan with contrast, avoid eating three hours prior to the exam. Also, you can consume only clear liquids. Diabetic: If you are diabetic, eat a light meal three hours prior to the exam. Your doctor may ask you to discontinue oral medications 48 hours before the scan. Consult your doctor for more information. Medications: All patients—expect for the diabetic ones—can continue to take their medications, unless suggested otherwise. For more information, please refer to the following simple preparation guidelines. 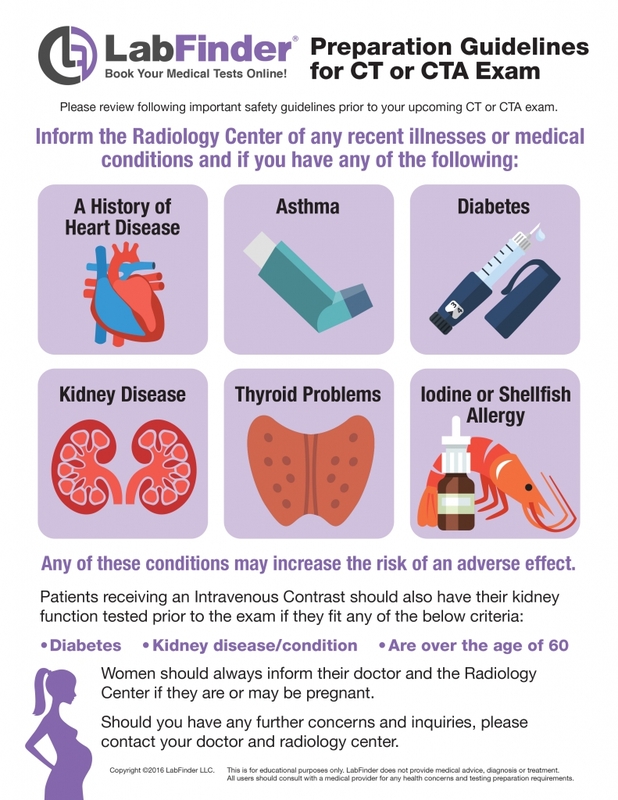 You can consult your doctor or radiology center where you are being treated. Do not forget to bring your LabFinder Order and Insurance Card to your appointment.